Hollie is a highly experienced dental nurse, having started her career in 2007 and becoming fully qualified in 2010. Prior to this Hollie worked in a customer service role. 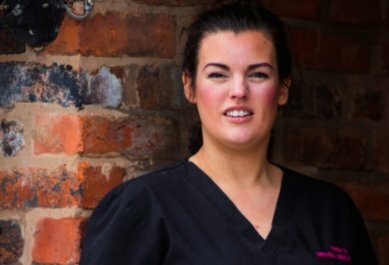 She worked in a large NHS dental practice in Stockton Heath before joining the team at Dental Solutions three years ago. Her natural interest and abilities in orthodontics has led to Hollie being appointed to the role of orthodontics facilitator at the practice. Hollie is here to look after your needs every step of the way, from organising your bespoke orthodontic treatment plan to booking your staged appointments and arranging suitable payment options. Hollie has also had braces herself and has worn upper and lower fixed metal braces as a teenager, then more recently some upper fixed ceramic braces where she was treated by Badri Chari- and as a result is now is a fully fledged retainer wearer. She is therefore more than qualified to answer any questions or concerns you may have about your treatment, and is contactable by phone or e mail if you need ever need her advice or support. Hollie is married to husband Joe with two young children Woody and Hebe. In her spare time Hollie is also in a band, the Nylon Hearts with two friends. She has even been approached about performing at Glastonbury.